The GPS records 9.3 knots of speed! Woot! Sue just whipped up a banana milkshake for each of us, topped with grated nutmeg. YUM! There are actually 3 cruising boats heading for Chennai right now. We talk to each other twice a day on the SSB radio, tracking each others progress. Vamp left the Andamans the same day we did, but she had to sail around the island chain so she's about 30nm behind us. But there's a "go‑fast" cat that's up in front of us called "Out of the Bag" that should be reaching Chennai about now. We met them initially in Labuan and then again in Langkawi, but both were very short meetings and we've been looking forward to getting together. They left Port Blair several days before us and heard us on the radio so they gave us a call. At the time they were headed for Salalah, Oman, but they hadn't heard anything about the Quest piracy and murders. When I told them about it, they discussed it for the night and decided to head for Chennai and skip the Mediterranean for now. Quest position, Friday 18 Feb, 0900 18°38'N, 061°54'E. Winds 2‑4 out of NE. ETA landfall (Richard's new waypoint D) Sat late PM thence following waypoints E and F to Salalah. ETA late Sun or Mon AM. Empty seas, crew well. Motor‑sailing with almost no winds on beam. Making about 7 knots avg. Encountered NATO warship L17 yesterday afternoon. They checked our status and our destination and eta. They said if any problems, get on VHF‑16 HI POWER and shout, as there were several warships patrolling the area and also call UKMTO as they were in almost constant "open line" contact with them. No questionable ships in our area at present. Doesn't sound irresponsible to us. I think this just shows up how impossible it is to patrol that much ocean, and how ineffectual the multinational fleet is with their current plan. The pirates are operating at will, and they'll continue until we get serious about the piracy issue. BTW, this eastern side of India hasn't had any pirates. We've been hurtling along out here. Just after noon yesterday the wind filled in, blowing at 15‑18 knots from just aft of the beam, a fast point of sail for us. At noon today we were at 12°07'N 87°24'E, or 309nm from the Andamans with 420nm to go to Chennai. About 8pm tonight we should cross our halfway line. We've sailed 163nm in the last 24 hours, averaging 6.8 knots. 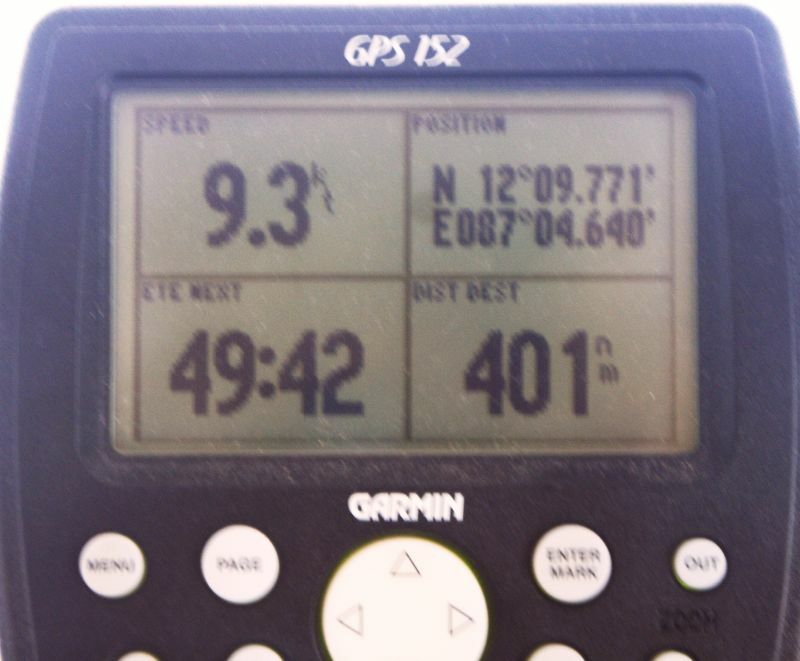 Ocelot's been scooting along at 8‑10 knots for long stretches, and the GPS says we hit 13.2 knots sometime yesterday.